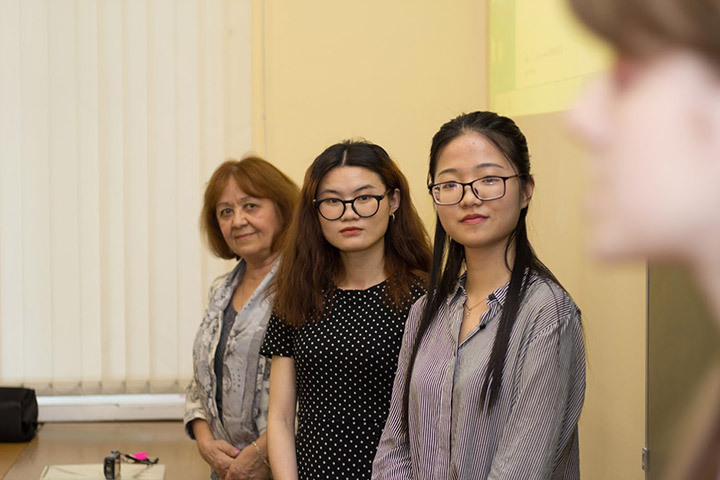 On April 4, 2019, a meeting of students learning Chinese and students of Chinese universities learning Russian was held at the Russian New University (RosNOU). The meeting was organized by the RosNOU Institute of Humanitarian Technologies with the participation of senior teachers of Rosa H. Anopochkina, Margarita V. Tokhta-Khodzhayeva, Oleg P. Popov. The guests of the meeting were George A. Gabrielian, the Head of the RosNOU International Affairs & Academic Mobility Directorate, and Ksenia D. Masterkova, leading specialist of this Directorate. The meeting began with an acquaintance. Students told about themselves and their universities and made presentations about their internships. Chinese students told about traveling in Russia, shared the most vivid stories and memories: about Maslenitsa, the first skiing in life, a trip to Lake Baikal and in Sochi, a New Year celebration on Red Square. RosNOU students prepared their stories in Chinese about their travels in China. Chinese students had two proverb games. In the first one, they explained with the actions and gestures the proverbs “seven don't wait for one”, “chase after two hares — you won't catch a single one”, “don't have a hundred rubles, but have a hundred friends”. Russian students had to guess which proverb was being said. In the second game, pieces of paper with proverbs were cut into two parts; one part was received by students from China, and the second one – by students from Russia. The task was to find a person who had the second part of the proverb. In the first round, Chinese proverbs were used, in the second – Russian ones. The students also spoke tongue twisters in the learned languages, sang Chinese and Russian songs, and translated Confucius quotes from Russian back to Chinese.